Swindon Town privately admitted that a comment made by manager Paolo Di Canio to on-loan French striker Jonathan Tehoue was "inappropriate", BBC Sport has learnt. In a statement earlier this month the club said the player's complaint of racist abuse was "without merit" and that Di Canio had "complete and unequivocal support". However, Swindon's solicitor wrote in response to Tehoue's lawyers in April, saying: "The club wishes to make it clear that it does not condone the reference made by Mr Di Canio during training on 29 March to your client." Di Canio was alleged to have referred to Tehoue by his skin colour, not his name, and is under investigation by the Football Association over the claims. Documents obtained by the BBC read: "The club accepts that the use of this phrase was inappropriate and apologises to your client for any upset that this has caused him." The club added that an internal inquiry "may result in disciplinary action being taken against Mr Di Canio". It added: "Mr Di Canio wishes to apologise for the comments, which he did not intend to cause offence by. "This apology is hereby repeated and the club also regrets that the comment was made by Mr Di Canio." 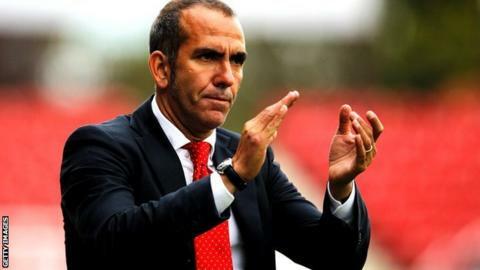 In a statement on Tuesday, Swindon said that the legal correspondence was exchanged "before an internal inquiry had been completed by the club in response to the complaint made by the player" and that "accordingly we continue to stand by Mr Di Canio and the contents of our statement issued on 15 May". Previously, Swindon's lawyers had insisted that Di Canio "in no sense intended the reference to be a racial slur", and argued that Tehoue had been in breach of contract by failing to train as requested. They described Tehoue's claim as "spurious". Tehoue originally complained to the club that Di Canio had made a racially abusive comment about him in front of Swindon players. On 5 April, Tehoue's lawyers wrote to Swindon complaining about a comment that "constituted a totally unacceptable and reprehensible racial slur". They also accused Di Canio of making "defamatory comments" about the player in the media which they argued had left Tehoue in an "impossible situation." Tehoue made just three appearances for Swindon before Di Canio ended the loan spell, telling BBC Wilshire "he's not as good as I thought he was." On 15 May, the club issued a statement saying that "the board was fully appraised of the facts at the time of the incident back in March and having investigated it, was satisfied that it was without merit and took appropriate action then. "Paolo Di Canio denies completely any suggestion that he used toward Jonathan Tehoue or anyone, abusive, insulting or threatening words or behaviour by reference to race or at all and the board wishes to reaffirm its complete and unequivocal support for manager in this regard. "Further, the board is wholly satisfied that any decisions concerning Jonathan Tehoue's playing career while at STFC were made for purely footballing reasons." A source close to the player told the BBC: "Jonathan was very aggrieved by Di Canio's dismissive racist remark about him. "His decision not to return to training was based purely and simply on the fact that he was not prepared to work for a manager who held such views. "Swindon Town appreciated Jonathan's position on the matter and, despite the manager's insistence, decided against fining the player. "Di Canio's subsequent attempts to tarnish Jonathan's reputation and ruin his future career opportunities with derogatory comments about his attitude and fitness in the press were completely unwarranted. "With regards to his fitness, prior to joining Swindon, Jonathan had started the last three consecutive games for Leyton Orient and performed well at League One level. "In addition, he was required to pass Swindon's own fitness assessment before signing, which he passed with no difficulties. "The decision to report Paolo to the FA was not taken lightly but it is one that he has been forced to take through Swindon Town's seeming unwillingness to address a matter of grave importance." When contacted by the BBC last night, the club said, "Swindon Town FC reaffirm the content of the statement that was issued on 15 May and has no further comment to make at this time. "The matter is the subject of an on-going FA review, which the club is fully supporting."